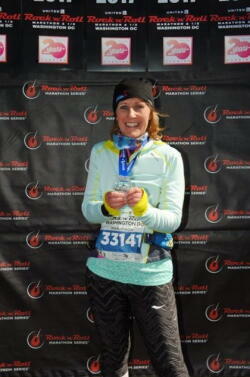 Meet Kelley Middaugh - Cancer Survivor and Training Program Mentor! We caught up with Kelley to ask her some of life's more important questions! Of all the shoes you wear, which are your favorite and why? Brooks Ghost has been my go to running shoe for the past 4 years. I've tried other Brooks shoes and other brands, but I find the Ghost to be the most comfortable. Have you ever had a nickname? What is it? For as long as I can remember, my dad has called me Noodle Ann because I will happily eat pasta for breakfast, lunch and supper. What’s your favorite family tradition? Christmas Eve Dinner with family. I usually make a couple pans of 12 layer lasagna and we open gifts. Aside from necessities, what’s something you can’t live without? I drive 50-300 miles per day, I cannot live without Satellite Radio in my car. If you had 30 minutes of free time, what would you do? Read one of the many books downloaded to my Kindle. If you were Waldo, where would you be? If I were Waldo, I'd be the first one across the Finish Line!